One reason I cook lamb a day ahead...it not only tastes better the second day, I can never plan how my day will go when something needs several hours to cook before a dinner time that is fairly regular every night. 1 1/2 lbs. lamb, shoulder roast - either tied whole or in parts. I do parts. Let marinade at room temperature for three to four hours. Heat olive oil in a saute pan, medium to medium high. Remove the lamb from the marinade to toweling and pat. Salt and pepper. Sear all sides very well. Fire roasted tomatoes, 14.5 oz. can - these make a difference worth the purchase. A curious toss of golden raisins, 1/4 c.
In the hot pan from searing the meat, add the shallots. Salt. Saute until there is some color. Add garlic, saute for a moment. Do not brown garlic. Add the wine to deglaze. Reduce until thick. Add the fire roasted tomatoes and herbs. Simmer for a few minutes. Salt to taste - isn't it yummy? Remove from heat. Add those golden raisins to the sauce. Put a few spoonfuls of sauce in a slow cooker or lidded pan. Put in the meat, top with the remaining sauce. Slow cook 6-8 hours or braise in the oven at 350 for longer than you do a pot roast. Check at four hours if in the oven...it could take as long as 6 hours or so. Now the pears...a few minutes before turning off the heat to the lamb...peel one, cube. Add half the cubes to the finished sauce. They will break down. Stir into sauce, it will be thick. Remove the lamb to a serving plate. 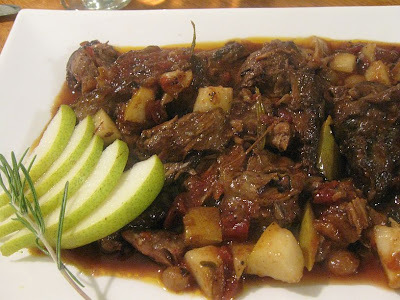 Gently fold the other half of the pear cubes into the sauce. Spoon sauce over the lamb. Oh boy, oh boy ~ yum! This was our dessert that night we had lamb. 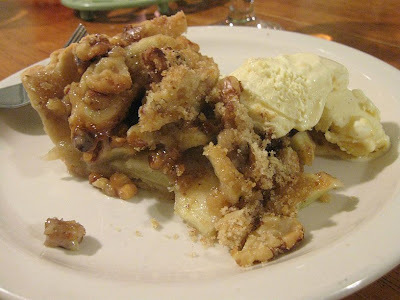 Apple tart with walnut streusel. Oh my goodness... you have so many yummy looking recipe's on here! I love lamb. And that Apple Crisp looks amazing!